So, being me, I started to analyze when I ran out and when I didn’t. 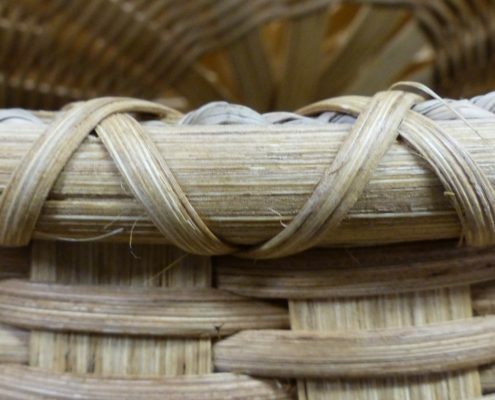 Which was correct – two and a half times around the basket or three times around the basket or …?? I took notes, lots of notes. I know, I know, you are thinking this lady is crazy and you are probably right, but I did learn a lot! 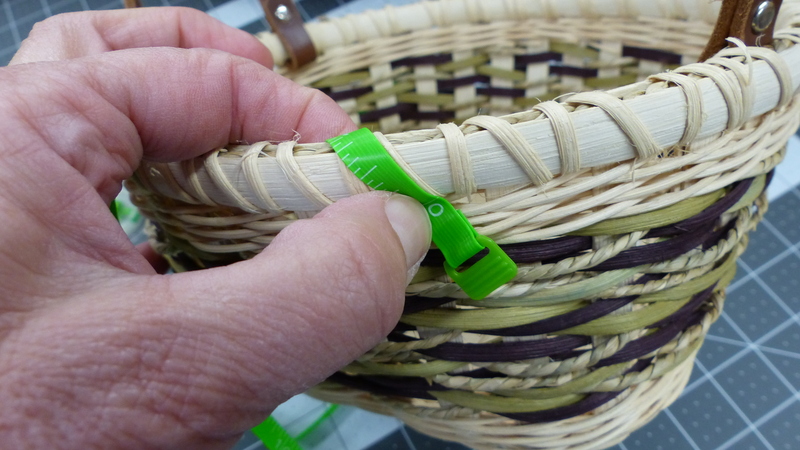 This basket, Voltage, has a circumference of 37″, I needed a lasher that was 186″. That is over five times around the basket! Obviously this three times rule doesn’t always work. After taking a lot of notes and trying several different methods, I made up a formula. For many years now, I have been using my lash formula whenever I lash with flat or flat oval reed. I also use my lash formula to determine how much lasher to add to kits. It works. Every time. You might find it helpful also. 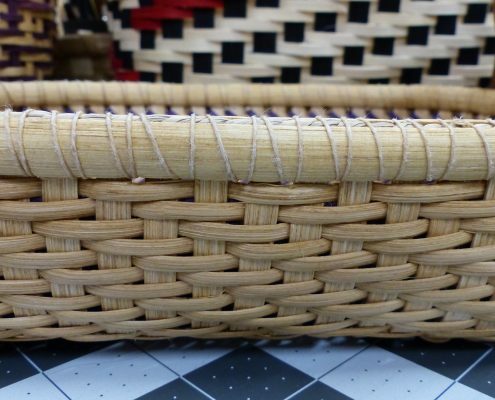 The old rule, three times around the basket, works for baskets that have a simple construction (i.e. 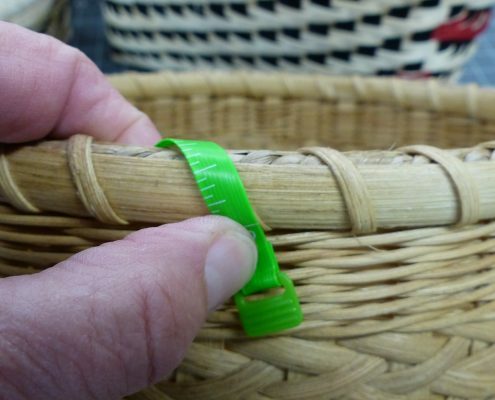 over one, under one weave with 1/2″ stakes spaced about 1/2″ apart) however circumference is not the only thing to consider when determining lasher length for your basket. 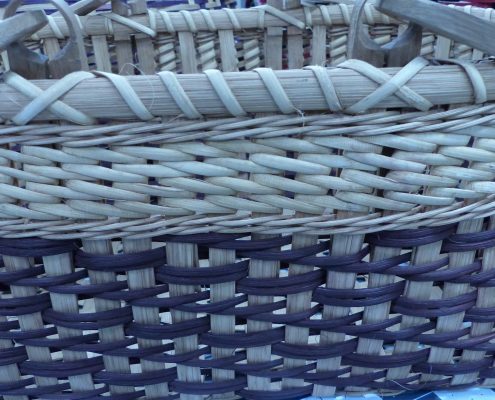 Lasher length is determined by a combination of number of stakes, basket circumference and rim width and thickness. I’m going to give you a formula – don’t roll your eyes and think this is a lot like math, because it really is simple and it really doesn’t take but a minute or two to figure out. Use a calculator or your phone or a piece of scrap paper – this is just one small step to insure that you don’t run out of lasher! 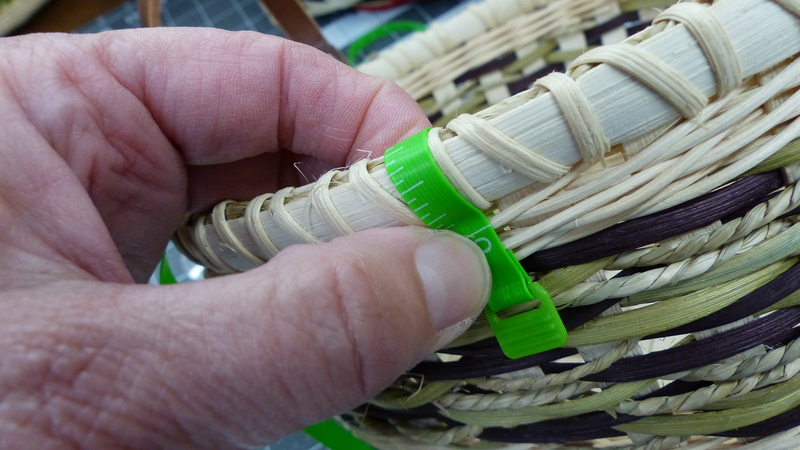 8 is the extra reed for starting and stopping – you can make it 10 or 12 if you are nervous. number of stakes – just count the stakes – all the way around and jot it down. N is the distance it takes the lasher to circle the rim while lashing one stake. 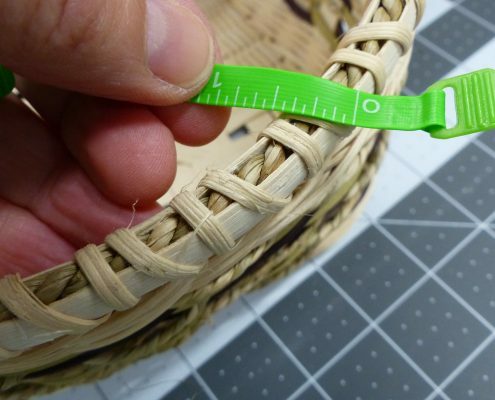 It is easy to determine this with a flexible measuring tape. 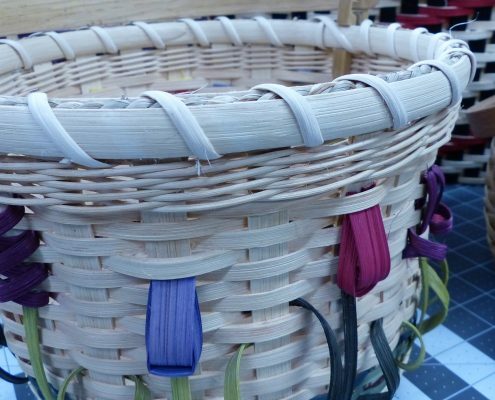 The basket has 32 stakes. Take your tape measure and lay it where the lasher will lay. 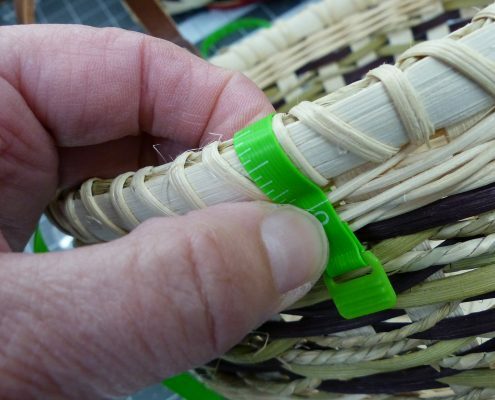 Measure from the base of the outside of the rim all the way over the top of the rim and to the base of the rim inside the basket. Remember the lasher will lay at an angle, from the center of one space over to the center of the next space, so measure at that angle. Make a note of this number. 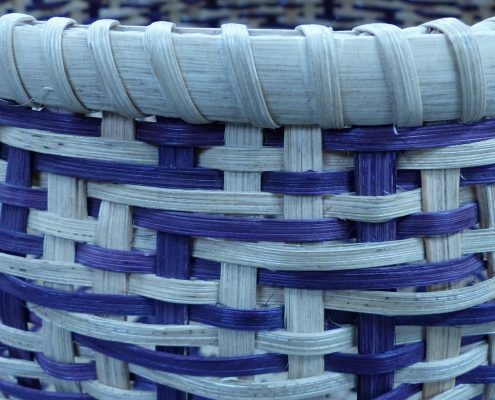 On this basket it was 2″ around the rim. Eighty-eight inches – I used 84″, and appreciated the 4 extra inches! 🙂 That extra minute sure beat being 4″ short! 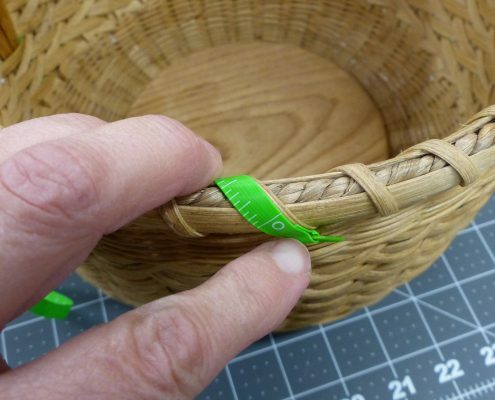 If your basket has handles and you plan to add an X where the handle and rim cross, you will need to add extra length. I do have a formula for this, but even I think it’s overkill. The bottom line is it typically works out that you need to add 6″ for each handle you want to X. 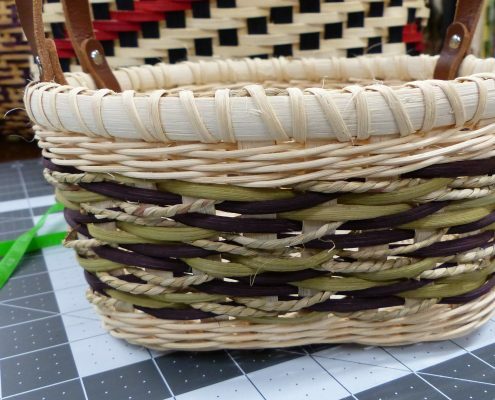 So if the Herringbone Carrier has one handle I would have to add 12″ so I could add two X’s, one on each end of the handle. So 88 + 12 = 100″ of lasher. 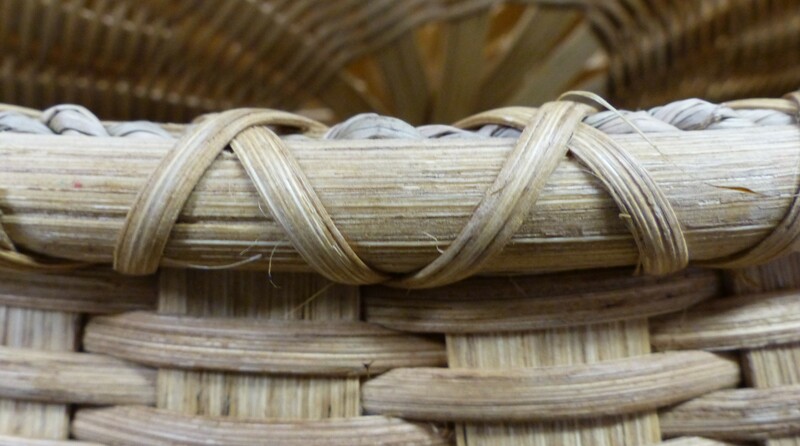 If you are double lashing (going around the basket two times), you just need to double the number of stakes. For example, if I had double lashed the Herringbone Carrier we used earlier, I would have doubled the 32 stakes and the formula would look like this: (2.5 x 64) +8 = 168. One hundred and sixty-eight inches of lasher. Take your tape measure and lay it where the lasher will lay when it moves from one space to the next. 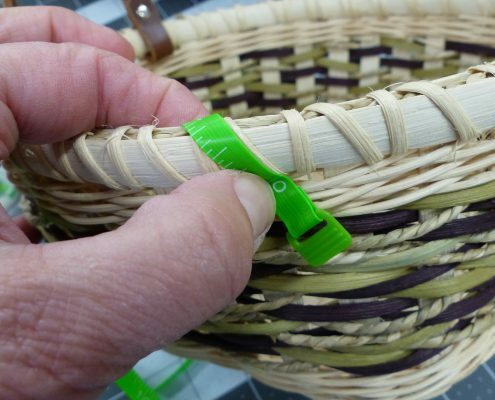 Measure from the base of the outside of the rim all the way over the top of the rim and to the base of the rim inside the basket. Remember the lasher will lay at an angle, from the center of one space over to the center of the next space, so measure at that angle. Make a note of this number. Now, take your tape measure and lay it where the lasher will lay when it goes back into the same space. 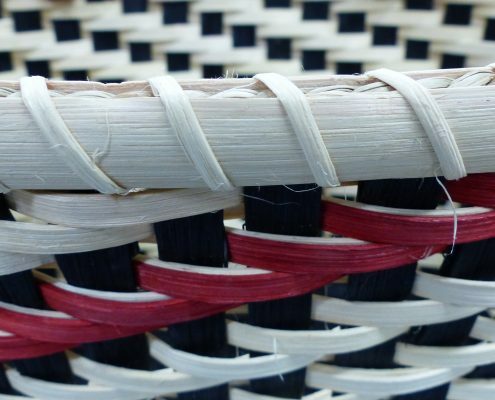 Measure from the base of the outside of the rim all the way over the top of the rim and to the base of the rim inside the basket. Remember at this point the lasher will lay straight up and down, from the center of one space over to the center of the same space, it is not at an angle. Make a note of this number. Now we need to measure the part under the rim, and it is easier to measure the top of the rim. And because the lasher loops into each space, twice we will need two numbers, be sure to measure once on a diagonal (pictured) and once straight across (not pictured). Make a note of both numbers and add them to the first two numbers. (4.25 x 32) + 8= 144″ I had about 8″ extra. 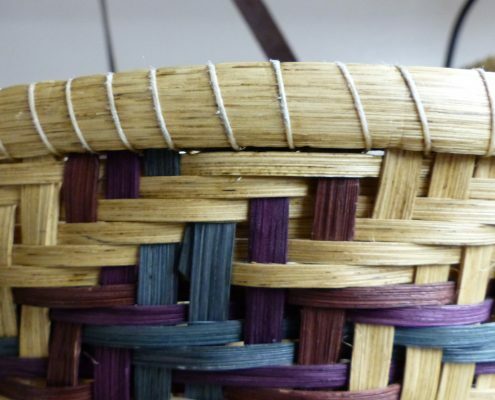 There are other fancy ways to lash a rim, and there are ways to figure out how much lasher you will need for each of those. Basically just figure out how much lasher is needed to circle the rim and multiply that by the number of stakes. Oh and don’t forget to add a little extra for insurance. Because I hate running out of lasher two or three stakes from the end. 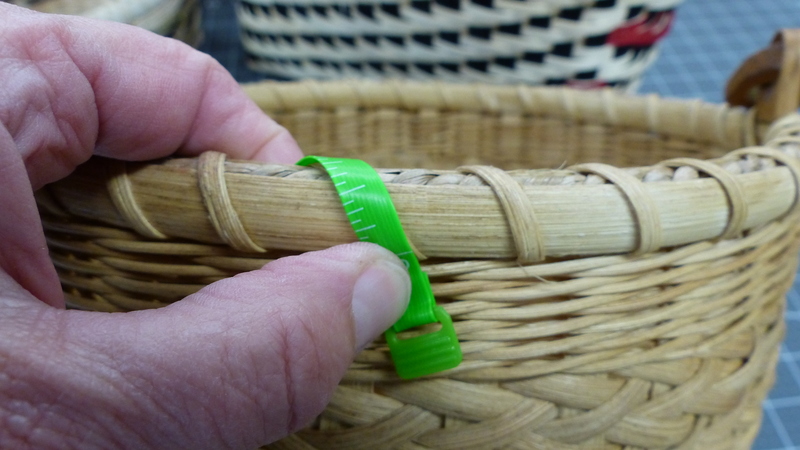 It is also very helpful to know how much lasher to add to a basket kit. I usually try to add extra to account for breakage. I can’t do anything about those coils of reed with only short lengths and sometimes lashers break, so on occasion I have to add on. 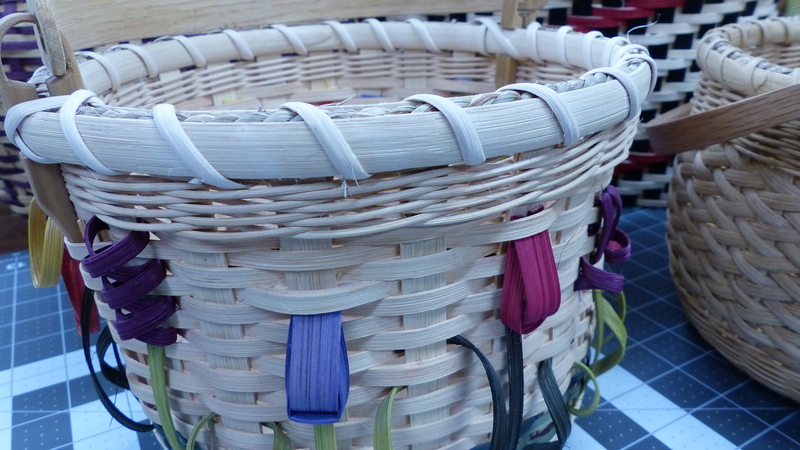 But it really is nice to know how much lasher a basket requires. 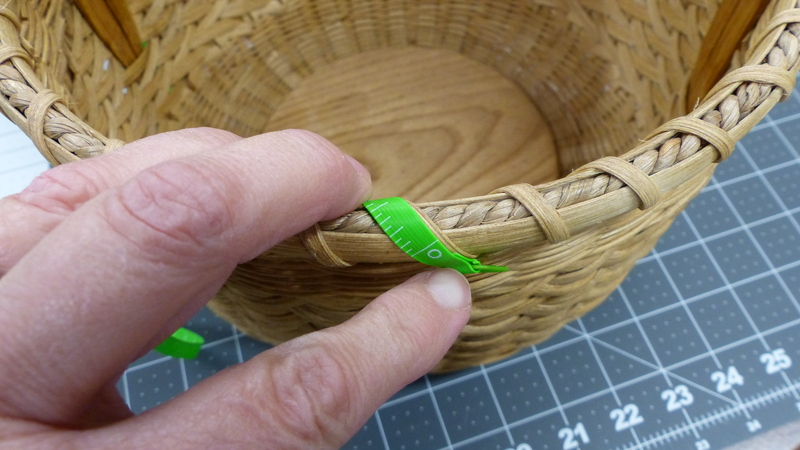 While I do use this formula to determine how much waxed linen I will need to lash a basket. I use mutiple shorter lengths, because it is easy to add to a waxed linen lasher and completely hide the knot (see my tutorial here). 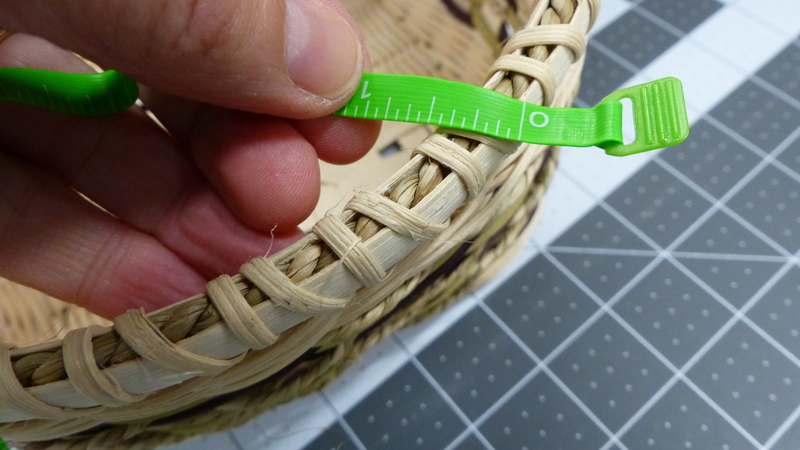 Just be sure to add 8″ for each length, that way you will have plenty to work with for adding on and ending. You may also find my earlier post on Lashing Basics helpful. You will find it here. You area storehouse of knowledge. I always learn so much from you.. Awesome tool thank you so much for all your work! I am amazed by your tenaciousness. I will use this formula instead of my “3 times around and a prayer”! Awesome Annetta!! I am always guessing! Will try this with my kits from now on! You Rock!! Omigoodness. You continue to amaze me woman. 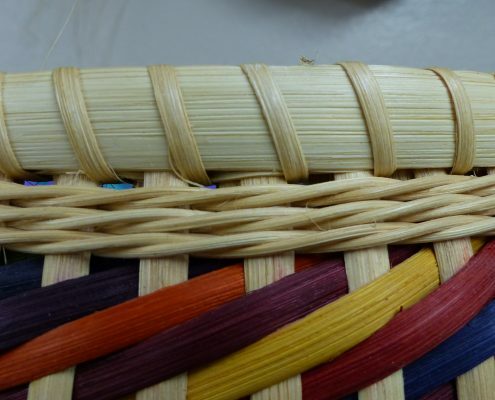 Thank-you so much, I will share this with my weaving ladies.